Like many movie fans around the world, I sat back with confidence that my Oscar pick for Best Foreign Language Film – “Pan’s Labyrinth” – was going to be announced. Then, I was startled to hear the words “The Lives of Others” instead. The year had belonged to the nominee from Mexico. Why did this unknown film from Germany take the honor? Since then, I have of course seen “The Lives of Others” and I now know why it won. It’s one really great movie. 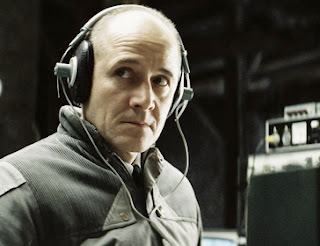 “The Lives of Others” interweaves the stories of an intelligence officer in 1984 East Germany, Captain Gerd Wiesler, and his subject, the playwright Georg Dreyman, suspected of being a Western sympathizer. I’m not going to dwell on the snarl of paranoia and politics involved in this situation though. Sure, the characters fear for their future lives at every twist around a corner and turn of a phrase. (Teaching a “getting a suspect to crack under verbal interrogation 101” class, Wiesler marks an “x” by a student’s name, indicating certain expulsion or worse, for merely suggesting Wiesler’s tactics are too harsh.) But the film is more universal. “The Lives of Others” tells the twin stories of a man who is great at a job he finds distasteful and two men who have difficulty pursuing their ideal occupations. A person’s strengths and available occupations are seldom an ideal match, in 1984 East Germany or any other time and place. Everyone and everything is given a very personal rather than political motivation. Wiesler is only tasked with gathering information about Dreyman because the Minister of Culture lusts for Dreyman’s girlfriend, stage actress Christa-Maria Sieland, and wants Dreyman out of the way. The turning point that sends both Wiesler and Dreyman hurtling down a new shared path toward their intricately interwoven fates is the suicide of a character close to Dreyman. “The Lives of Others” reminds me of the “political” thrillers from Hollywood in the 1970s. It has the intricacy and attention to procedure that distinguished such films as “3 Days of the Condor” and “All the President’s Men,” the kind of meticulous focus on the details of how a suspect is interrogated or how a writer is identified by the typeface of his typewriter that recently inspired such films as “Zodiac” and “Michael Clayton.” More than any film though, “The Lives of Others” reminds me of Francis Coppola’s surveillance masterpiece “The Conversation,” a film that was a clear influence. In Coppola’s film, Gene Hackman’s Harry Caul records the lives of others much like Wiesler. Both men are portrayed as masters with ears so finely tuned that they can “see” with them. (At a key moment, Wiesler seems to “see” the hiding place of a typewriter by sound alone.) And both men are very lonely and have little in the way of lives outside of what they experience by listening to others, the real story of both films. Wiesler first spies Dreyman and actress Sieland at a performance of a play written by the former and starring the latter. The film then goes on to make fascinating play with the idea of audience and performer. Wiesler takes in what he hears between Dreyman and Sieland in Dreyman’s bugged apartment as if it were a play. At one point, Wiesler runs into Sieland in a pub and expresses his admiration for her performance. We are left wondering though just which “performance” he means, on stage or on his surveillance tape. “The Lives of Others” diverges from the 1970s “cinema of loneliness” (film critic Robert Kolker’s phrase) approach filled with loner anti-heroes and downer endings and ultimately hits an uplifting note. At three key points in the story, the phrase – or a piano melody of the title – “Sonata for a Good Man” pops up and “The Lives of Others” becomes a film about how goodness can surface in unlikely situations and in unexpected people. At film’s end, Wiesler buys a novel written by Dreyman. When the clerk asks if he wants it gift wrapped, Wiesler declines saying, “It’s for me.” I’ll leave it for you to discover the simple beauty of that final line.